The Formula One title battle between Red Bull's Sebastian Vettel and Ferrari's Fernando Alonso will go down to the wire in Brazil after McLaren's Lewis Hamilton won the US Grand Prix on Sunday. Championship leader Vettel finished second after starting his 100th career F1 race on pole position while Alonso remained in contention with third place and is now 13 points adrift of the German with one race left. While Vettel was denied a third straight title, Red Bull were able to celebrate the constructors' title -- becoming only the fourth team in the 62-year history of the sport to take the championship three years in a row. "It's incredible, something that everyone throughout the team has worked incredibly hard for and to have achieved it is something...I'm speechless really," said team principal Christian Horner. Vettel need finish only fourth in the Sao Paulo finale to take the title but the weather at Interlagos can be fickle and the wily and consistent Alonso cannot be ruled out for what would also be his third title. "The race unfortunately hinged on one backmarker who didn't use his mirrors, that was the difference," said Horner after Hamilton passed Vettel for the lead on lap 42 after the German had lost time behind Indian Narain Karthikeyan's HRT. "There was nothing between the two of them today. They were trading times all afternoon and it was that one backmarker that cost us. 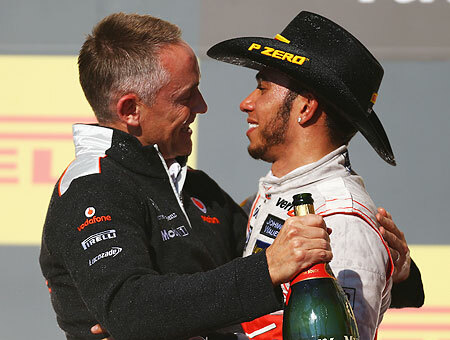 "But congratulations to Lewis, he's obviously had bad luck at other races and it was important to finish ahead of Fernando," said Horner. 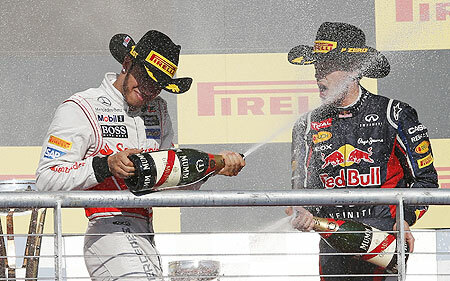 Hamilton, winner of the last US Grand Prix staged in the United States five years ago, had been second at the start with Alonso lining up seventh. The Spaniard would have started eighth but Brazilian Felipe Massa took a five-place penalty to move his Ferrari team mate to the clean side of the grid. "A first-time winner. I'm so happy," beamed Hamilton, interviewed by US Formula One great Mario Andretti on the podium, of picking up where he left at Indianapolis in 2007 by winning the first race at the new Circuit of the Americas. 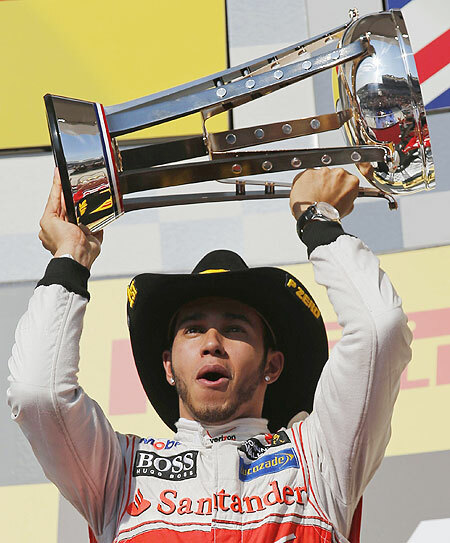 "It was such a warm welcome and one of the best, if not the best, race of the year -- especially for me and the team," added the 2008 champion, wearing a cowboy hat on the podium, who is moving to Mercedes at the end of the season. "It's been a long time since we had a win. I'm so proud of the team and grateful for the support we've had." While Vettel and Red Bull team mate Mark Webber got away quickly, Alonso made his move and was fourth after the first corner. The Spaniard was gifted another spot on lap 17 when Webber retired with an alternator problem in a worrying development for Red Bull. 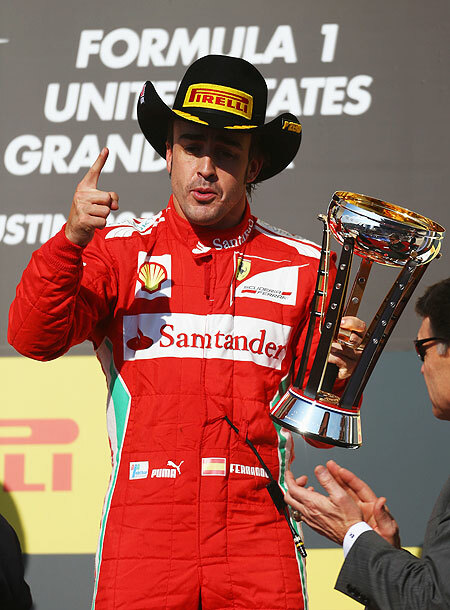 Needing to finish fourth or better to keep Vettel from clinching the title if the German won the race, Alonso kept his Ferrari near the top of the leaderboard for the entire race while Massa finished fourth. Hamilton's teammate Jenson Button was fifth after an outstanding drive while Kimi Raikkonen, winner in Abu Dhabi two weeks' earlier, was sixth for Lotus.